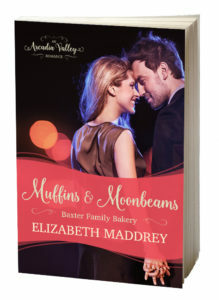 I’m super excited that the release of Muffins & Moonbeams is less than a month away! This book was so much fun to write and the feedback I’ve been getting from my beta readers has made my heart happy. So far people have loved Malachi, and that’s lovely because I have a teeny crush on him myself. Malachi Baxter is happy to hide in the background and manage the business-end of the family bakery. He’d much rather live in the online world of computer games where he can explore the galaxy and no one has to know he’s deaf. Ursula Franks designs websites during the day and spends her evenings battling alien races online where relationships are easy and uncomplicated. When she agrees to design a website for the local Community Supported Bakery, she has no idea that Malachi is the real man behind her online persona’s best friend and her own secret crush. As the two work together on the website, they uncover an attraction, but will they be able to put aside past hurt and insecurity to find love? I had a lot of fun writing this book. I suspect no small part of that is because I enjoy playing online role playing games like Malachi and Ursula. My husband and I have spent many an enjoyable Saturday on our computers fighting goblins and other creatures together in various online worlds. Often my dad, sister, and brother-in-law join in. We haven’t played as much recently as we did before kids (amazing how those kids eat up your gaming time, isn’t it?) but it’s still something we try to work in when we can. Ursula also stole a little piece of my heart, and I hope that you come to enjoy her. She struggles with some of the same insecurities I’ve struggled with my whole life. I wasn’t sure delving into that was something I wanted to do, but that’s where the story took me, so…what’s a writer to do? And now, since I’ve teased you with this much, perhaps it’s time for a little excerpt to round out the appetite whetting? Malachi clicked on the mission, double checked that he had all the required equipment on board, and opened the map. He chose the first star system he’d need to visit and set the ship in motion. It wasn’t instantaneous transport, which made the game a little more fun. Things could go wrong en route. There were pirates for one, and the handful of people who were irked at him for beating them to prizes. Most of them got over it and remembered it was just a game. But there were others who needed a stiff dose of reality. He tried to steer clear. “Started without me?” Scarlet Fire’s chat message popped up. Muffins & Moonbeams releases March 14, 2017. It’s available for pre-order already wherever e-books are sold. Thanks, Wembley! I’m so glad you’re enjoying our town! Gah! Wemble! Sorry. I thought I checked my autocorrect. Hehe, no drama. I sent out an email with my husbands’ name spelt correctly (Tim), autocorrect changed it to Tom??!! Oh I was totally taken by surprise with the deaf revelation. I’d not have guessed that (I’ve preordered it already and now I’m even more looking forward to reading it). I hope it lives up to your excitement :) If you haven’t read Loaves & Wishes (in Romance Grows in Arcadia Valley) you get a good introduction to all the Baxters there. I have the bookset but didn’t make that far yet. My son arrived a month before he was due and everything changed (for the best of course), but that also meant that I haven’t had time to finish reading anything that came out / I bought since early January. That’s going to be an interesting read since the hero is deaf. That’s going to be some exciting communication when his heroine finds out. That’s for sharing. I’ll admit I cheated a little and based Malachi on a deaf friend I had growing up who had lost her hearing at age five after learning to speak. So he can speak clearly enough that often people don’t realize he’s deaf. My friend always had fun with that in youth group. I enjoyed the excerpt, Elizabeth. Congratulations! Hi Elizabeth. Enjoying the Arcadia Valley Romances. Muffins and Moonbeams is pre-ordered. As a teenager, I worked in a bakery for 3 years. My favorite bakery in our town is Bit of Swiss. They make the best Artisan breads. They are celebrating their 50th Anniversary. Nice twist with a hero that is deaf. As a pastor’s wife and teacher I have worked with both deaf and blind people. Looking forward to your book. Congrats. I was thinking I didn’t know if I’d like this story or not, until I read the excerpt. Wow! Hooked me right in. Will have to check it out! Oh yay! :) That makes me happy. Isn’t that how we are so often? We want people to know the best-foot-forward “me” not the real me. We fear we’re unlovable. Pitiable. Folks, I had the privilege of beta reading this story a few weeks ago. You’ll love it! I’ve got it pre-ordered too, and am eager to read it! Looks like fun! Online gaming is a whole new world for me! This sounds like my kind of book! Congrats….hope to read it!! Thanks Jackie, hope you enjoy it! Sounds like a great story and I’m curious to see how Malachi’s story turns out. I’m intrigued that he’s deaf and interested to find out how Ursula reacts when she finds out. Oh, I haven’t read any of these books yet, but this series sounds really good. I like the bakery theme and am glad to see some new contemporaries. Thanks, Sylvia! Contemporary romance is what InspyRomance does, so the more you hang around with us, the more books you’ll hear about :) Hope you get a chance to enjoy my Baxter Family and Arcadia Valley. I vastly enjoy series books so I will be ordering this!! I haven’t heard of this series, but will definitely be looking it up now. I agree with Valerie, and the book excerpt, that it is often not easy to let people see the real you/me. The excerpt caught me quickly so I’ll be preordering. I have enjoyed every book I have read of yours and am certain this will be no different. I loved Muffins and Moonbeams and all of Arcadia Valley. I want to live there. Thanks Linda! It would be a lovely place to live.